WordPress has updated their dashboard to add several nice features for sites hosted on WordPress.com. It has redesigned the toolbar and font sizes, refreshed the design and improved the speed of the dashboard. One of the most exciting new features of the dashboard is an upgrade to the full-screen writing mode to eliminate more of the interface for focused writing sessions. The ‘New Post’ button is gone, replaced with an ‘Add New’ menu. The new dashboard features Visual Editor icons designed by Ben Dunkle, who also did the new navigation icons for the dashboard. This is a nice visual tweak and the redesigned icons also make more room for an expanded post box that allows for easier editing and more text to be on the screen at once. I work much of the time on an 11″ Macbook Air so the extra real-estate in my browser will be nice. The extra room doesn’t stop there though as WordPress has also upgraded the full-screen view for distraction-free writing sessions. The new full-screen mode eliminates the visual editor across the top and limits text to a post-size box in the center. The old style had the text going all the way across the screen, which made it hard to judge and format text and more difficult to proofread. 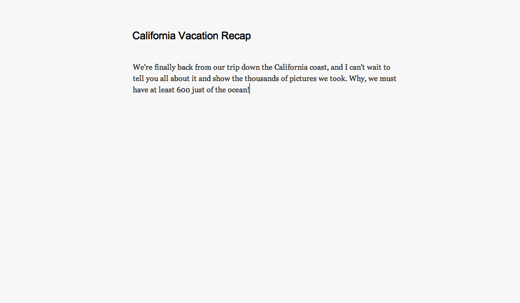 The new full-screen mode acts much more like WriteRoom or other minimal writing tools. It’s activated by clicking the blue, screen-shaped icon in the top row of the toolbar. You can get a tool bar back once the mode is enabled with a nudge of your mouse but it fades away after a few seconds to leave the interface as clean as possible. Even then, the toolbar is greatly diminished in size and the tools are limited to the essentials and a save button only. You do still have access to HTML or Visual modes and keyboard shortcuts. In addition, support for Internet Explorer 6 has been discontinued because the modern WordPress interface does not work properly in the aging browser. With this update, WordPress has discontinued support for Internet Explorer 6. It has required increasingly complex code trickery to make the WordPress dashboard work in the IE6 browser, which was introduced 10 years ago and does not support current web standards. If you’re using another out-of-date browser the new version of WordPress will also warn you with an orange banner and a link to an upgraded version of your browser. If you try out the new full-screen mode and like it, tag a post typed with it with the term ‘just write’ and leave a link to it in the comments to the WordPress announcement post here and they will pick five favorites to appear on Freshly Pressed and get a WordPress swag pack. 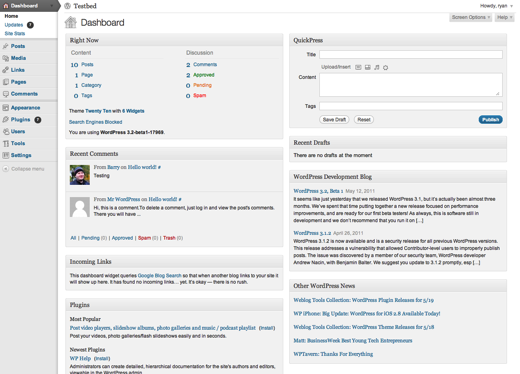 The new dashboard is live for all WordPress.com sites now. Try out the new features and let us know what you think in the comments below. Read next: What's next in Web design? Forget mobile formats.